All summer long I anticipate fall. I love everything that goes with fall, the crisp morning runs, planting chrysanthemums, Halloween, the end in sight to lawn mowing and no more ticks. All through those hot August days I kept telling myself that fall was "just around the corner"...just have to make it to September! Well, September is here and half over and the temperatures are still in the 90's pretty much every day. YUCK! I'm ready for fall to BE HERE! While I love running, (a LOT) I love running so much MORE when it's cool outside. 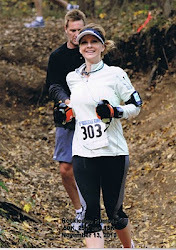 Do-Wacka-Do 25K trail race is next weekend. No goals for time really on that race..but I would love to be somewhere around 3 hours.